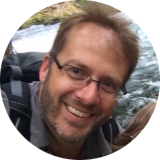 National Parks – Tour Guide Mark – Let's Go Exploring! This was an exploration of two dramatic volcanic landscapes timed with the Autumnal Equinox. 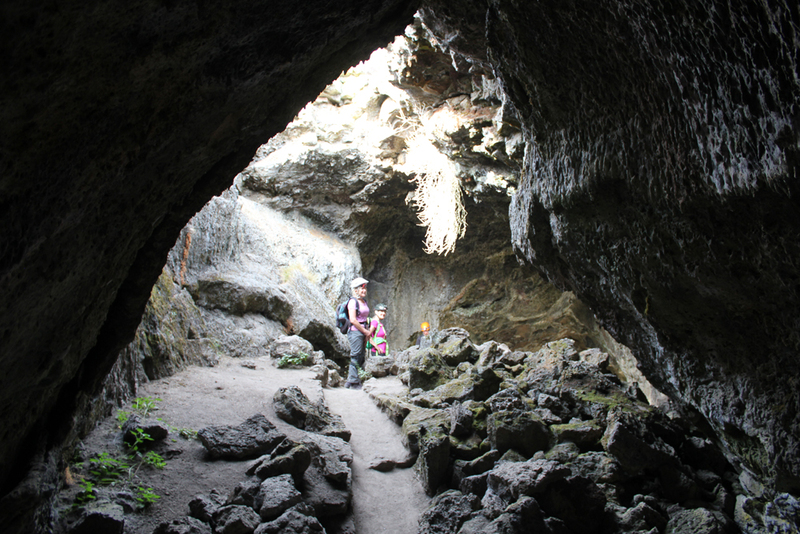 Upon arriving at the forbidding Lava Lands National Monument we made camp and then explored several accessible lava tube caves around the visitor center. We also climbed the conical shaped 5,302-foot tall Schonchin Butte where we enjoyed views 100 miles east to the Warner Mountains, near Nevada, and 50 miles west to Mount Shasta. 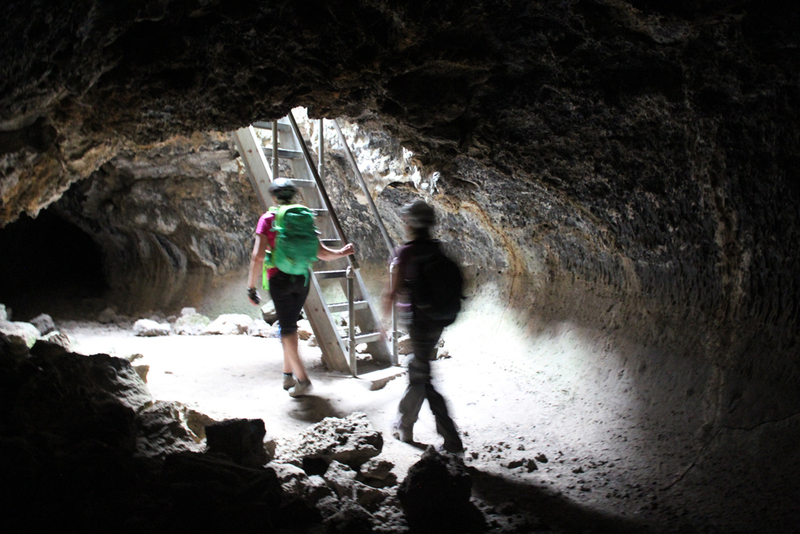 In the evening, we walked along a dusty trail into the Schonchin Wilderness Area and encountered an entrance to a lava tube that was at least 4 stories tall. The next morning we hiked from the campground to Skull Cave where a small ice pond can be viewed year round. 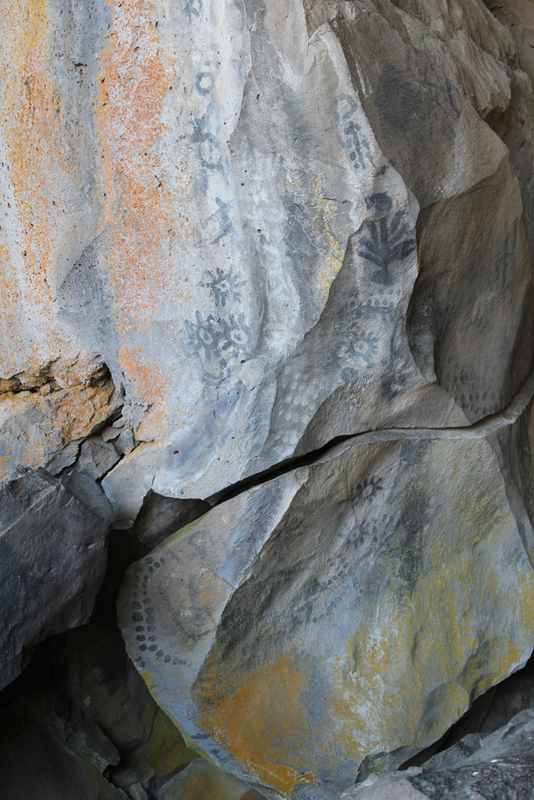 We also hiked to several pictograph caves and enjoyed our lunch on the trail. 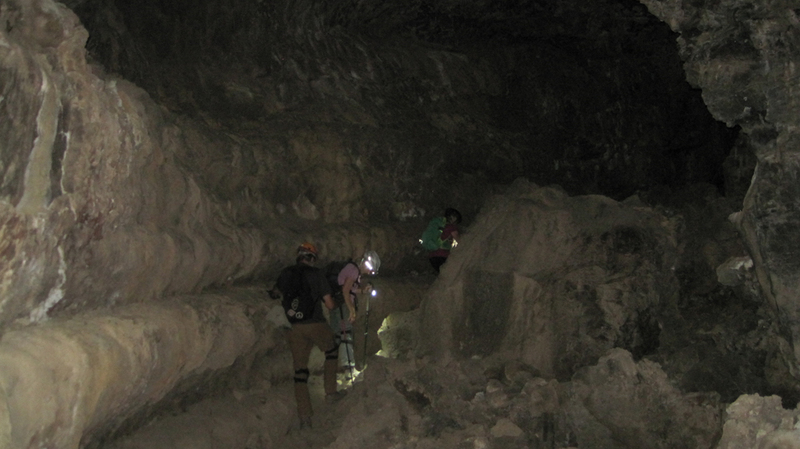 As the afternoon warmed we spent our time underground where we explored three caves and partially a fourth. Back at camp, we were surprised to discover that several hundred bugs had descended upon the hood of one of the cars, possibly attracted by the metallic-blue color. They had apparently been engaged in a frenzied mating and exhausting themselves to death. Bugs that fell onto the ground were snapped up by an eager lizard. 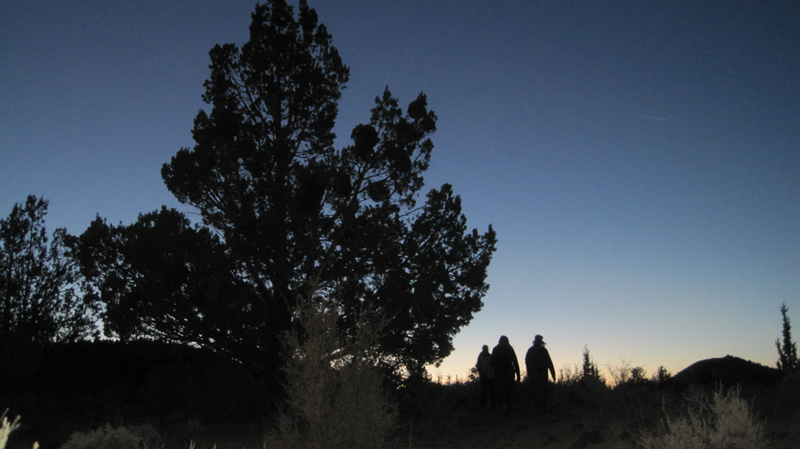 As the sun set, we hiked into the nearby wilderness and enjoyed a pastel sky. On the third day, we packed up and drove through the northern section of the monument. Our last stop was to Petroglyph Point where a monolithic wall includes petroglyphs, raptor nests, and evidence of former wave action. Tule Lake was a gigantic, yet shallow inland lake that existed for millennia. The lake was drained in the early 1900s and the exposed land turned into farmland. The existing lake is far to the west and is one-sixth its original size. 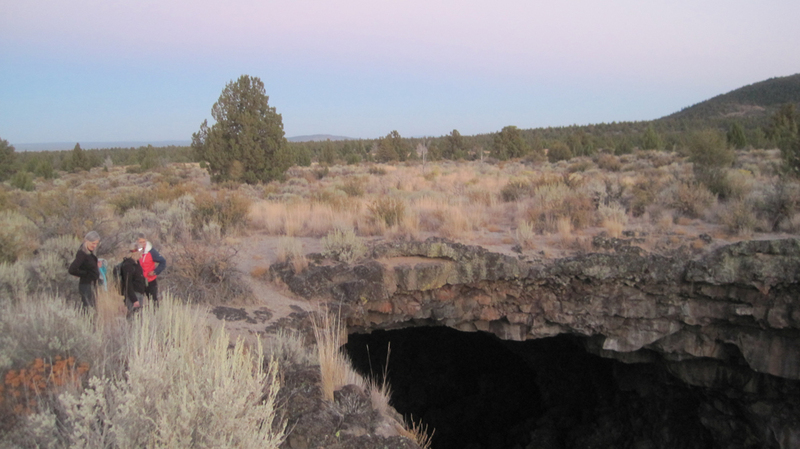 Future explorations to Lava Beds will include additional sites of the Modoc War and seeing the remnants of an imprisonment camp where Americans of Japanese ancestry were forced to live during WWII. In the afternoon we drove to Crater Lake and made camp. The Mazama Campground was closing for the season and this was its last weekend. Upon our arrival, the sky darkened and it rained for several minutes. After making camp we hiked to the Great Spring and down the picturesque Annie Creek trail loop. In the late afternoon, we made good use of the camp showers then drove the rim to enjoy the views from Discovery Point. At dinnertime, we made our way to the historic Crater Lake Lodge where we raised a glass to celebrate the Autumnal Equinox then enjoyed a meal. Back at the campground, a nearly full moon encouraged multiple parties at neighboring campsites and sleeping was difficult. On day four we woke to a frosty 28 degrees Fahrenheit. We warmed up though at the local Annie Creek Restaurant with some hot coffee and breakfast. As we drove along the east rim to the Mount Scott trailhead the sky was blue and clear. We hiked for about an hour to this highest point in the park, which stands just less than 9,000 feet. 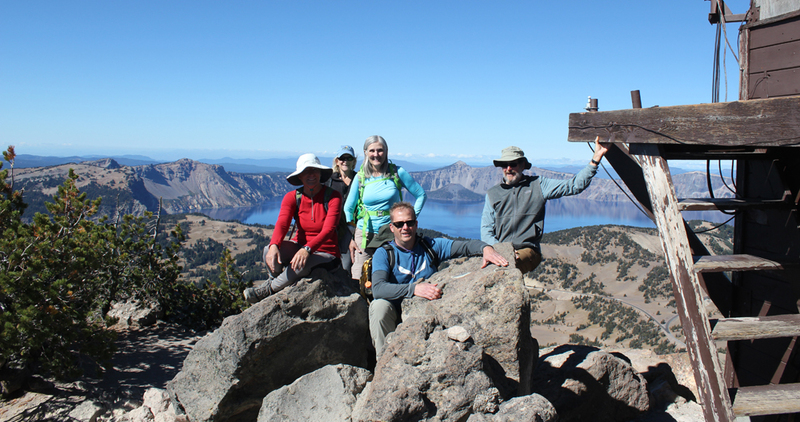 The view of the once massive volcano Mount Mazama, now known as Crater Lake, was superb! We could see about 100 miles in each direction; to the north the Three Sisters, and to the south Mount Shasta. As noon approached we hiked back down the mountain and ended our trip with a late lunch. There was a definite chill in the air, fall had arrived. The Marin Headlands offers breathtaking views of the San Francisco area and Pacific Ocean. 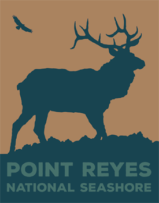 Join us on Saturday, May 16-17 as we explore the area around Point Bonita Lighthouse before hiking to Hawk Camp which overlooks the Gerbode valley. Sunday, we appreciate the 360 degree views of the bay area the Bobcat Trail offers before continuing to Rodeo Beach for an afternoon of beachcombing and exploration. 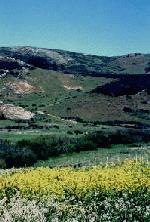 One possible side trip includes the Marin Mammal Center which rehabiliatates marine creatures. Total hiking distance is 8 miles. 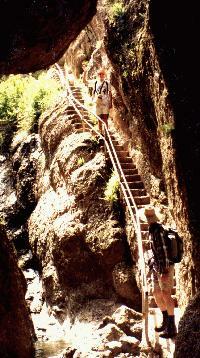 Join us for an 8-mile loop hike through the rugged spires of Pinnacles National Monument and caves. This is a fun but strenuous trip. Flashlights are required. Be prepared to get your feet wet as a small stream will flow through the cave. The hike begins and ends at the Ranger Station. 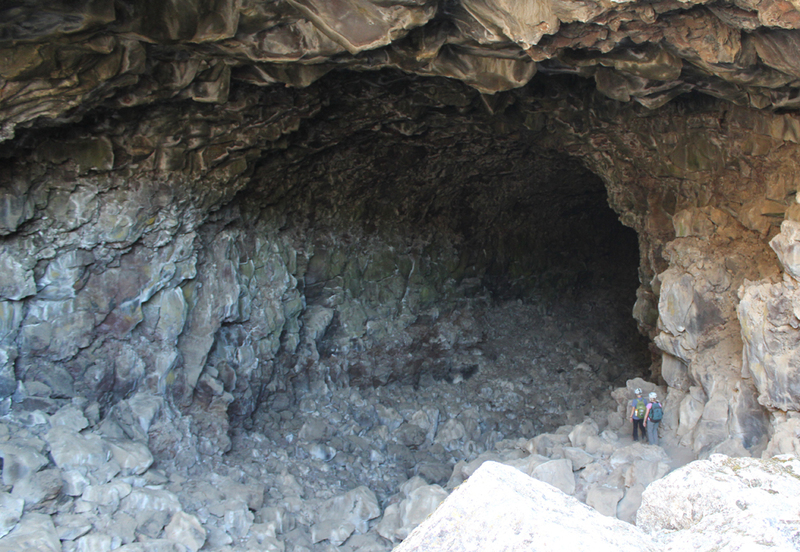 Be prepared for bright sun and temperatures on the warmer side, a light jacket may be needed for the caves. Meet at the Sanborn Park Hostel where we will determine carpool arrangements and depart promptly at 7:30 am. Maps to PNM will be provided. Please allow for a two hour travel time. We’ll regroup at the Park Headquarters between 9:30 and 9:45 a.m. Day use fee of $5 per vehicle.